Right now at 10:00 pm on the 25th day of July with an actual temperature of 91F and a "feels like" temperature of 96F, I declare that we have reached the dregs of this drought and it cannot get any worse. The ground is littered with what I like to call "drought droppings", mostly dried up leaves and flower petals that just could not hang on any longer and fell to the ground, no doubt stirring up some drought dust as they each silently hit the dirt. I hope no garden fairies have been struck by this drought debris. 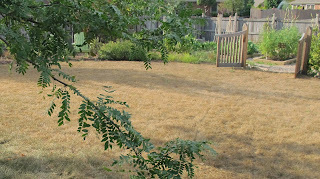 Some of the plants that still have leaves seem to be in a permanent "drought droop" and almost beg me to cut them back. I just pray that the roots of these plants, mostly perennials, are alive but dormant as though it is winter, and that once it rains again, they'll recover with new shoots and leaves. I'm told to expect this and I hang on to this dream, for without it, I am left with bare ground. My hand is sore from holding the trigger on the hose spray nozzle and I'm nearly devoid of garden dreams as I stand there with the hose, evening after evening, trying to avoid collapsing in a heap of drought doldrums. But, Hortense, as I put the hose away this evening at dark o'thirty, I realized that I did not want to survive this drought and hope that next summer is better. I realized that I want to recover from this drought, right now, with a real temperature of 91F at 10:00 pm. I want to reclaim my garden from this drought and heat and enjoy it once again. Now. I am certain that other gardeners feel the same way. There is no joy in surviving a drought and living to tell the tale. If this is the new reality for my garden, I will embrace it and encourage other gardeners to do the same. Our joy will be in recovering from this drought, and showing others how to do the same. We'll reclaim the delight we had in gardens that flourished. We'll be inspired by plants that bloom and prosper no matter how dry it is. . We will draw strength from a garden well-tended. And we will do this whether it rains or doesn't rain. Are you with me, Dear Hortense? If so, let's get started now on a Gardener's Guide to Drought Recovery. You make a great cheerleader Carol. While I know you are suffering along with your garden you are looking ahead as do all of us gardeners. No doubt you'll be successful !!!!! Meantime I'll send you a little bit of wet fresh energy. May your dreams of rain and recovery come true soon, Carol. Carol, I certainly agree with you! I'm hoping for a recovery this summer! It's getting difficult to keep the hope alive. My friend Michelle's blog post the other day (July 23rd)(http://michellescountrygardens.blogspot.ca/) was about what was RIGHT with her garden. Framing the question this way helped me. I hope it helps you too. Which of your plants are thriving in this weather? Sedums? Ornamental grasses? We need a joint list to plan for the years to come!